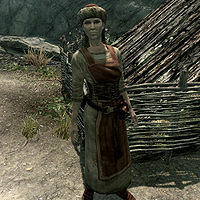 Fridrika is a Nord citizen who lives at Solitude Stables with her husband Geimund and son Horm. Geimund owns the Solitude Stables and is a retired mercenary. If he dies Horm will sell the horses. With her husband in charge of selling the horses, Fridrika helps out with maintaining the small farm behind the stables, although most of her time is spent wandering and looking for potential customers. She sleeps in the stable building every night between midnight and 8am and always starts the day with a one-hour breakfast. At 9am she heads outside and for 11 hours, interrupted only by another one-hour meal at 6pm. At 8pm she heads back inside and wanders around until her bedtime at midnight. She wears a typical merchant outfit which consists of boots, clothes and a hat. She carries a spare belted tunic, an iron dagger and a selection of lower-class items and gold. She is not particularly helpful and will quickly point you towards her husband with: "Is this about the stables? My husband, Geimund, handles the business." If her husband is dead, she will instead point you towards her son: "Is this about the stables? With my husband gone, my son Horm handles the business." Other than her sales speech, "A man/woman like you should own a horse. Go speak with my husband. ", she seems uninterested in the place and will say: "I really don't mean to be rude, but I don't think there's much I can help you with. ", "My family's weathered its share of problems, but we don't dwell on the past." and "Plenty of chores to do..."
This page was last modified on 20 March 2013, at 04:45.